Travel from Queenstown or Te Anau to the Hollyford Valley then walk with your guide through native beech forest to Pyke Lodge. 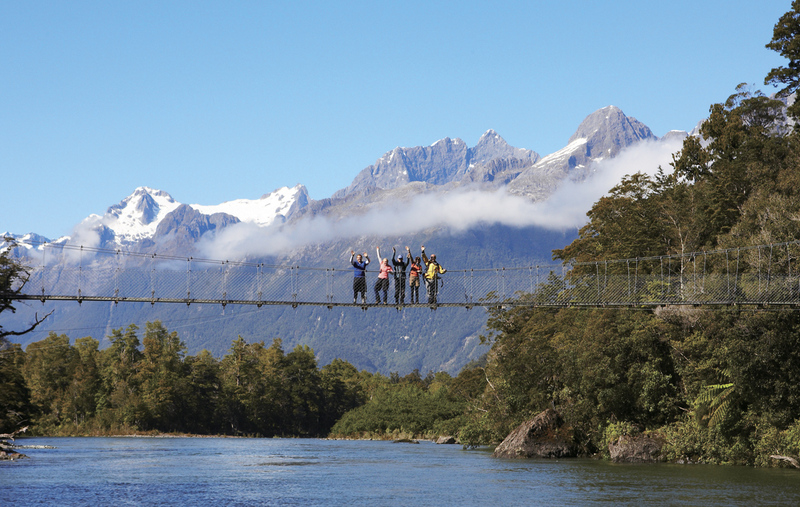 You'll re-trace the footsteps of Maori and early pioneers while walking in the shadow of the mighty Southern Alps, including Fiordland National Parks’ two highest peaks - Mt Tutoko (2746m) and Mt Madeline (2537m). Soak in the morning light on Lake Alabaster before boarding a jet boat for the next part of your adventure. You may even encounter a family of Bottlenose Dolphins who are regular visitors to the lower river and lake. Walk through ancient forest giants such as native rimu, totara and kahikatea before arrival at your home for this evening, Martins Bay Lodge. Explore Martins Bay spit today and learn about the history of both its Māori and European settlements before flying by helicopter into Milford Sound where the coach awaits to return you to Te Anau and then Queenstown. Your scenic flight takes you along the rugged coast and into the truly spectacular and dramatic Milford Sound. An amazing finish to your journey . . .